Who's got jokes? I've got jokes! 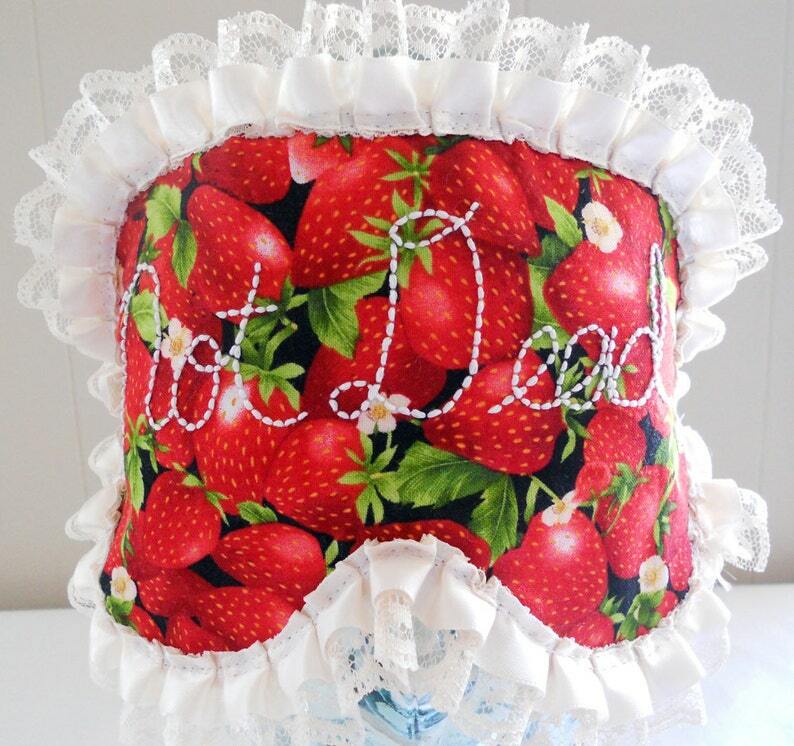 I was asked to make this Custom Strawberries Sleepmask with Hand-Embroidered "Not Dead" carefully stitched on the front and I decided right then and there that I would offer these puppies on the regular! A little bit of Sweet and Sassy! 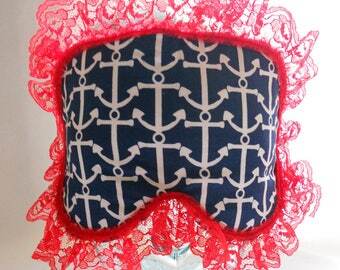 My Sleep Masks have a cotton outside, satin lining and soft batting on the inside. Soft, flexible elastic keeps your mask in place. This was AMAZING quality and what an amazing design. I am sooo happy with this product I am going to have to order some for friends. I’m ready for my shower, dahling. My adorable new navy blue with lemons shower cap is not very comfortable, but it is very functional and cute. I've been getting more into head scarves recently and this is a perfect addition to my collection. I love how the coral stands out of against my skin. Even though the scarf is definitely orange and not pink in person, I love the color. Love wearing it. Nice communication with shop. We accept Paypal and Direct Pay via Etsy. Large Custom Orders will require at least a 50% deposit. If you are unable to pay with either of these methods, please send me a message and I'd be happy to work out a different arrangement. I will only ship the item after payment has been received and has also cleared. These pieces are handmade, we try our best in describing the item as best to our ability along with taking pictures that showcase each piece. Unless already in stock, each item is considered "made-to-order". I will do my best to offer an exchange or store credit as I strive to make each customer happy. Due to hygienic reasons, I cannot offer returns or exchanges on my Shower Caps, Sleepmasks, Hair Wraps, Scarves or Glad Rags unless they have been unused (with the tag intact and in original wrapping). I ask that you please contact me within 7 business days so that I may remedy any issue in a timely manner. Please note that Custom Orders are non-returnable. If there is an issue, I will gladly make adjustments, but I am unable to offer refunds or returns on custom items. If there is an issue with shipping (ie lost, stolen, damaged), please contact me within 7 business days of receipt of the package and I will work with you to find the best solution for the problem at hand. Handling takes up to 3 days. Items are shipped via First Class with confirmation tracking (shipping upgrades are available, though). With the Holiday Seasons, you may want to consider Signature Confirmation for your order! I take great care in my work and would like for you to receive your item exactly how it left my studio. If you are ordering a Shower Cap, Sleepmask, Glad Rag, Bowtie/Necktie, Kitchen Accessory etc. please expect about 1-2 weeks turnaround time for completion. Hand Embroidery should take about 3-5 weeks for completion. Custom Order completion times are on a case by case basis. If you are needing an item by a specific date, please let us know! If you are interested in purchasing our wares for wholesale or consignment, please contact us! We'd love to talk with you!